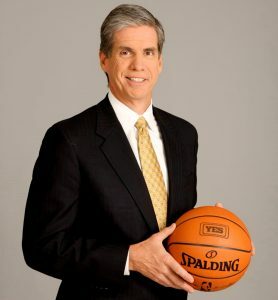 A former college and professional basketball player, Jim provides basketball analysis on television for both CBS Sports and the YES Network. For 22 years he’s broadcasted the NCAA college basketball tournament (“March Madness.”) and for 29 years, he has broadcasted the Brooklyn Nets basketball games – now on the YES Network. In 2014, Jim earned two NY Emmy’s: as Best Sports Analyst for his Nets work on YES; and for participation in YES’ Nets broadcast team which won for Best Live Sports Series. He also earned NY Emmy Award nominations in 2010, 2011 and 2018 for his Nets analysis on YES. As a basketball player at Duke University, Jim earned All-American honors in 1979 and Academic All-American honors in 1978 and 1979. He was Duke’s team MVP his final three seasons (1977-79), the team captain as a junior and senior, NCAA East Regional Most Outstanding Player in 1978 and played two seasons for Duke’s baseball team. A 1979 Duke graduate, Jim was selected by The Philadelphia 76ers in the 1979 NBA Draft, playing for the 76ers in 1979-80. He played the next four seasons with the Dallas Mavericks, leading them in scoring during the 1980-81 season. Born in Jersey City, Jim played ball at Hudson Catholic High School (Jersey City). He and his wife Janet have four children.